Anna was eating a strange cold thing today after her dinner. Suddenly she decided I ought to try it too so she gave me it. It was absolutely delicious. As it melted more and more I worked out a technique for sucking the whole creamy bit out of the cone. 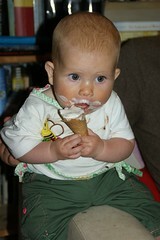 I hope Anna shares her next ice cream with me too!